I always loved this game. I did notice that this one had all 4 levels and I could never understand why the NES version didn't, especially when Nintendo made it, WTF?! As others have said, this is the best of the home conversions... despite Kong being on the wrong side of the screen. 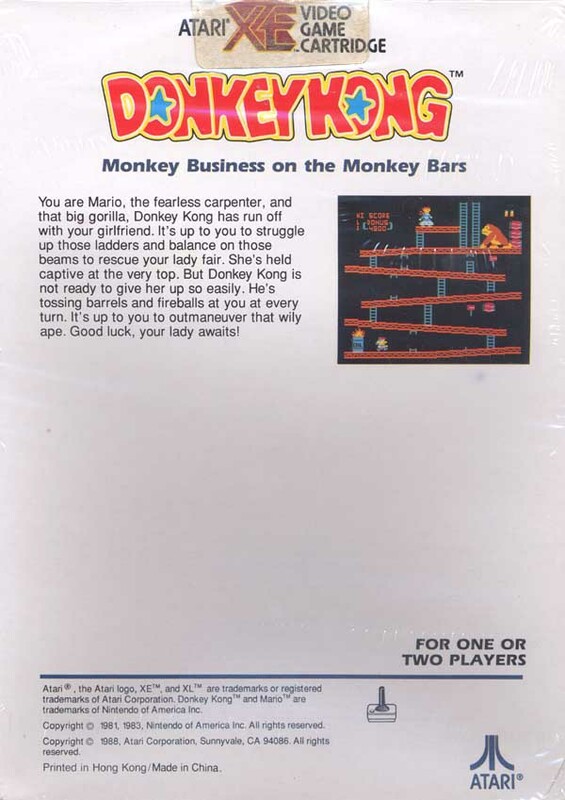 This is the best home version of Donkey Kong, and includes all four arcade screens (something missing from even the NES version!) and sterling gameplay. One of the Atari 800's crowning achievements. Simply awesome. For fun try jumping the oil drum on the pie factory; also jumping off the platform ends into the screen edges is neat for avoiding barrels!! 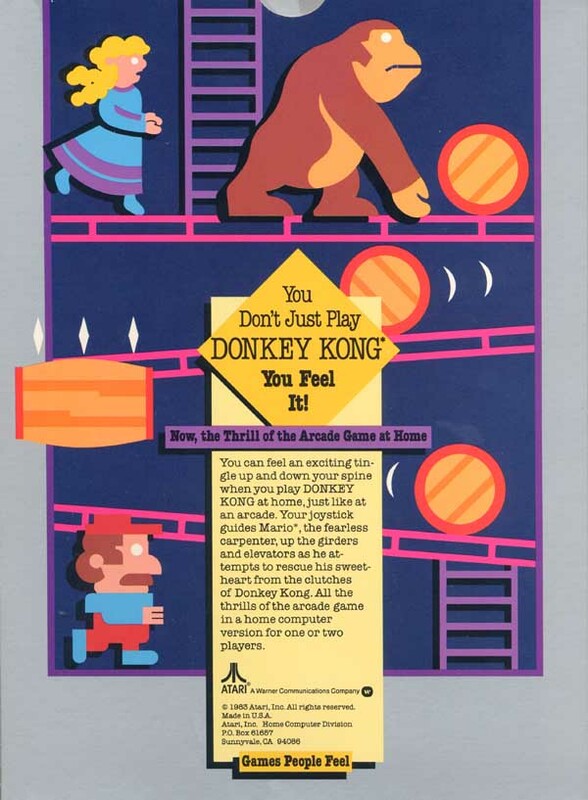 Donkey Kong for the Atari 8 bit computers was the best Donkey Kong that was made except for the arcade version. 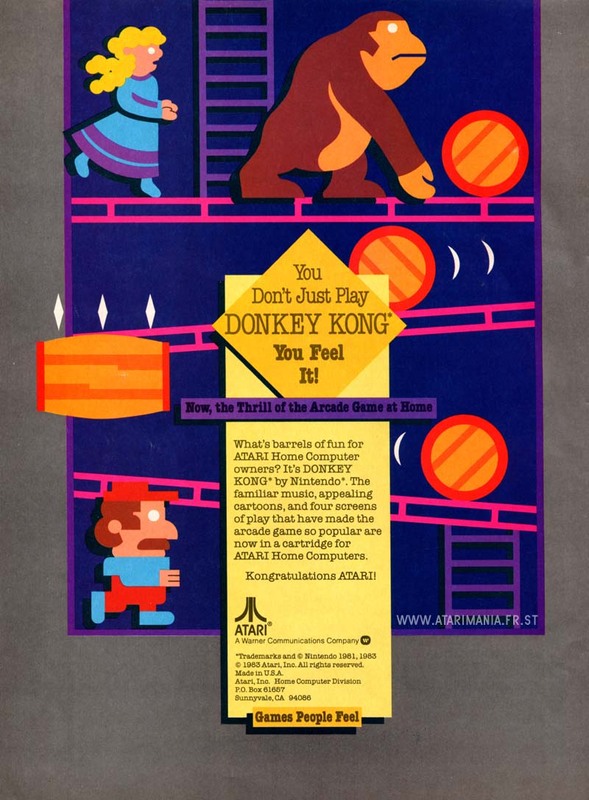 The Atari 400 Donkey Kong has all four screens. Unlike the Colecovision, NES and Atari 7800 versions. It even includes the How high can you get? intermissions. 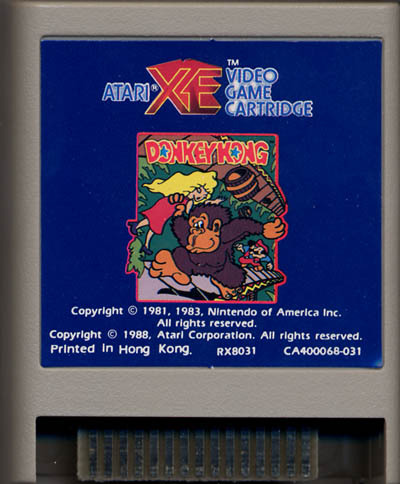 If you want a damn good Donkey Kong, buy the Atari 400 version. You can find it and the Atari 8 bit computers on Ebay. I like this over the arcade version and all other versions I have tried-- C64, Atari 7800, Colecovision, Coco, etc. Excellent controls, collisions are very good, and can't be improved much unless you stretch the screen. Hi jlw! What "that other guy" is talking about is simply personal preference. 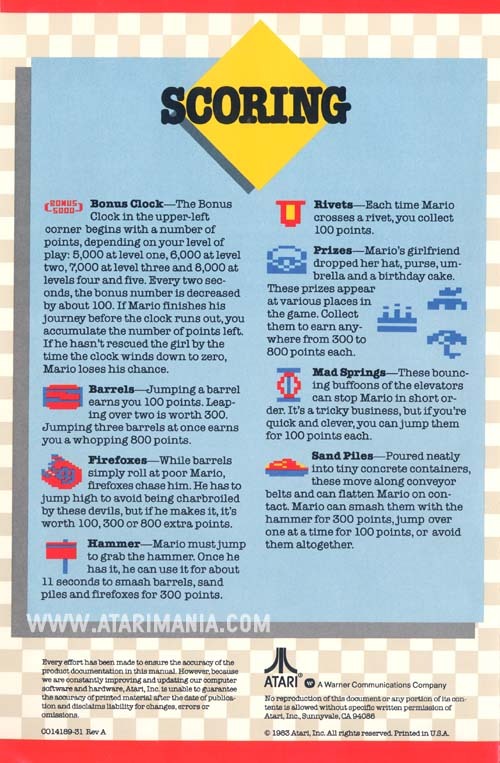 I like this game a lot and play it regularly, I just feel that Atari could have done a better job with the movement of Mario going on and off the ladders. In my estimation its a little funky. On the DK Junior cart the movement has none of this stickiness and allows for split second motions. Just my opinion, though...Cheers! I don't know what that other guy is talking about. 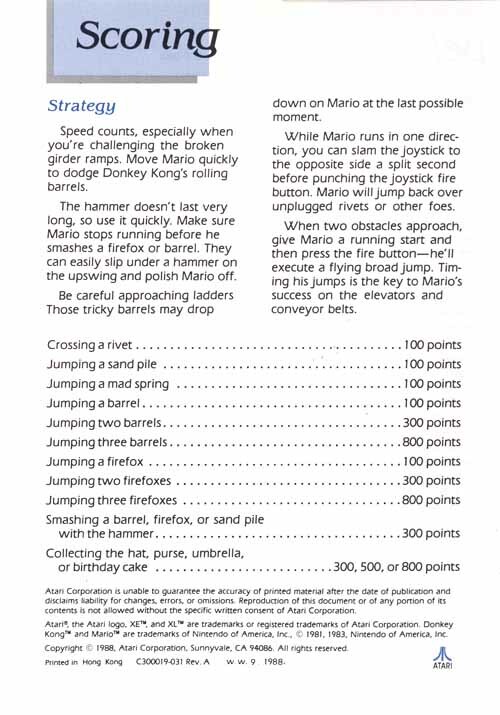 This is the most playable version of Donkey Kong ever. This is the ONLY version where the barrels bounce when they fall. This is the best home version ever. I'm surprised that all the comments here are so positive. While the graphics and sounds are wonderful, I have always felt that Atari could have done better with the playability of this game. 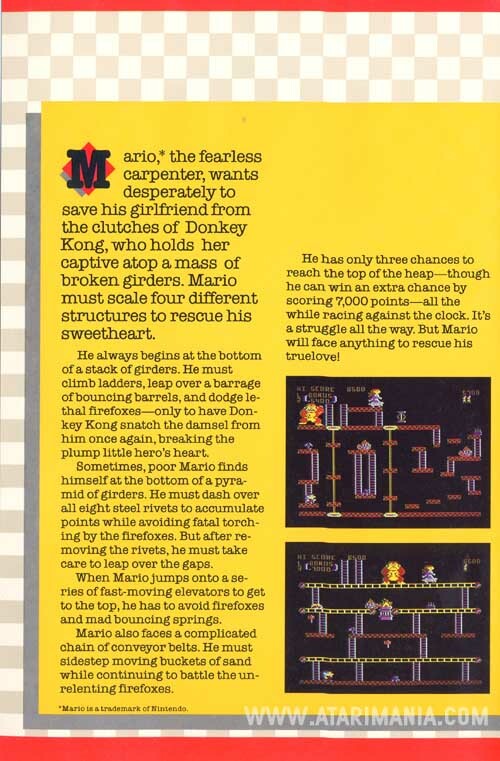 Most notably the transitions off the tops of ladders onto the next platform...Mario often seemed to catch or freeze slightly before being able to move side to side, and at the higher levels even the slightest delay is often the kiss of death. 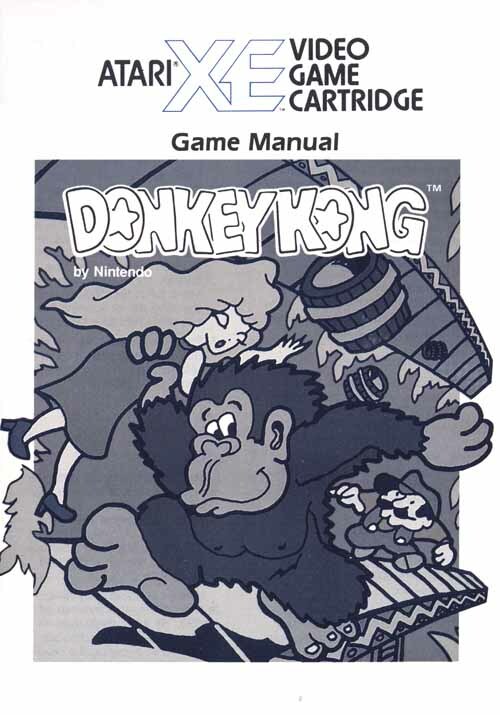 I always prefered their Donkey Kong Jr. to this original. I'm with Greg B. on this one. The C64 version had some good playability, but the screens are all out of order. 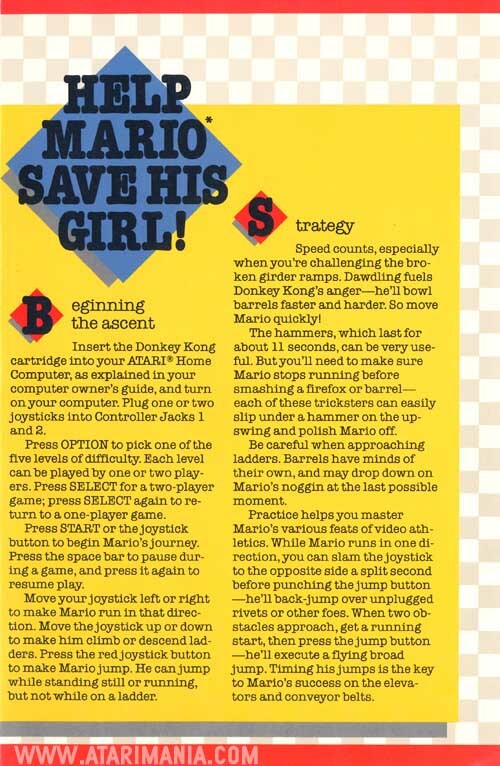 It's like the authors never played the original coin-op. For the time, this was an excellent port; though I prefer the Ocean C64 version ( http://www.lemon64.com/games/details.php?ID=750 ) . But it did have the benefit of coming out three years later. Simply put, this is the best home translation of a coin-op game EVER. Period. This was excellent as most Atari home conversions were. 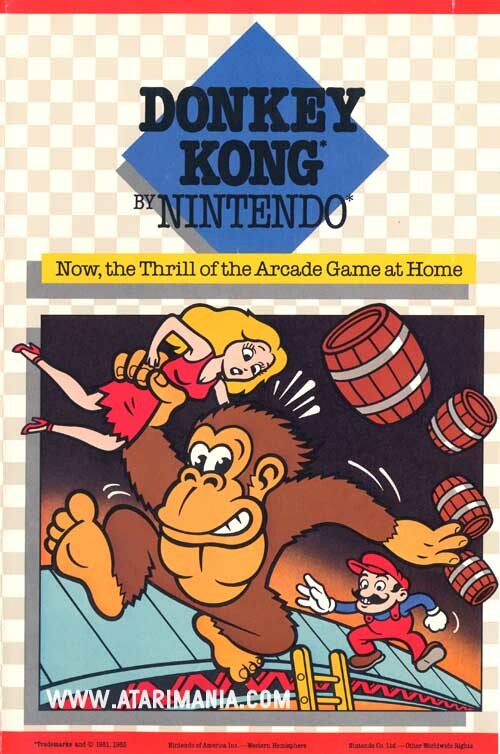 You had all four screens of the arcade version, plus you also got to see Kong fall on his head in the second screen level. It had everything going for it: good graphics & sound with smooth, challenging game play. 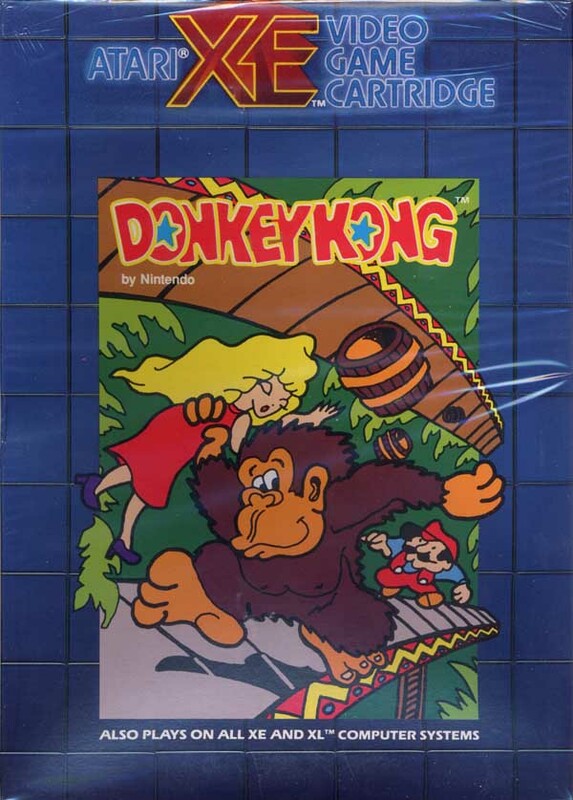 The only problem was that it was released one year after ColecoVision got all the publicity (and sales) for its new game machine, which came with Donkey Kong! 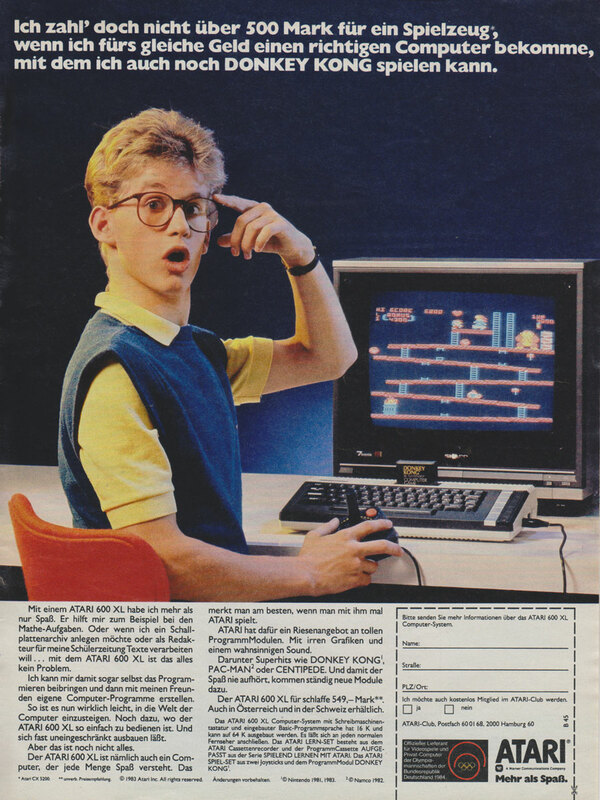 Coleco also entered the video game market and put out a laughable rendition of the game for the 2600. 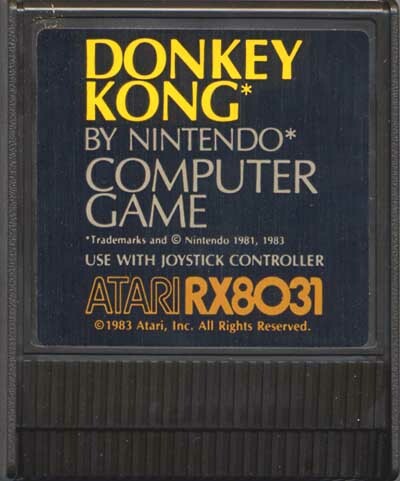 So when Atari finally arrived with their own, excellent version of Donkey Kong for the 8-bit, it got lost in the shuffle. It's still a classic! Possibly the best 'home' conversion of this game I've played. All four of the screens, difficulty balanced just right (5 levels to choose from) and basically a convincing run through Mario and DKs first big hit. 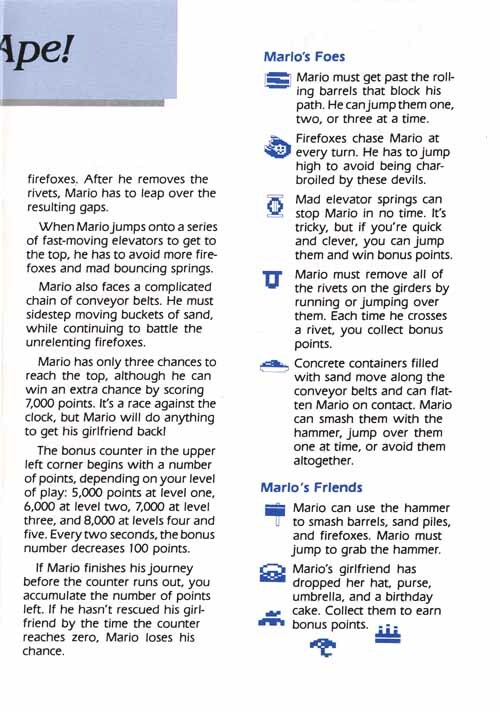 This version of the classic offers four complete levels. A very satisfying gameplay situation, since there were many others released for a variety of systems that lacked all levels. The graphics are a little chunky - to be expected with the Atari 8-bit generation - but the little extras more than make up for it. 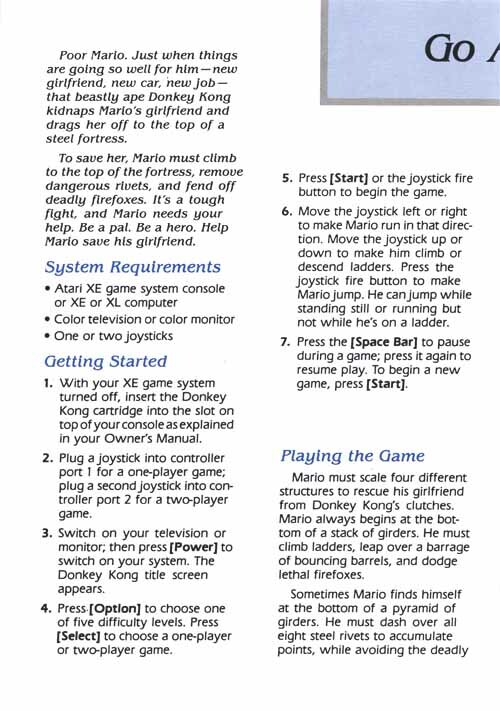 Top drawer from Atari's programmers. Highly reccomended! simply the best donk i have ever played. all 4 leves are complet and very fast. better than atari 2600 or 7800, Coleco or anything else.